Genoa is a captivating, unspoilt city with a truly Italian flavour, so an Italian course in Genoa is a perfect way to learn the language! Formerly one of the most powerful city-states in the world, and a pioneer of exploration, Genoa possesses a profusion of palaces and great historical riches. 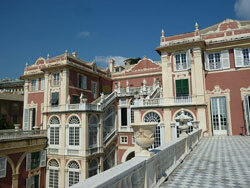 Learn Italian in Genoa and spend days wandering back in time through the medieval streets of the city. These ‘caruggi’ lead to splendid open squares and antique townhouses, painted every shade imaginable, overlooking the deep blue waters of the Mediterranean. Enjoy spectacular views of the city from ‘Il Bigo’, a lift built in the style of a ship crane to pay homage to Genoa’s great seafaring tradition. In the scenic centre of Genoa, just a short walk from the seafront, our school occupies a beautifully restored historic building. 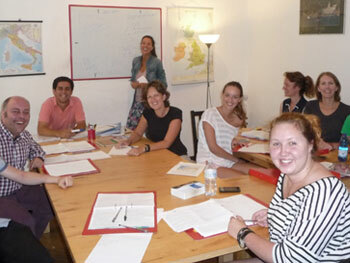 You’ll learn Italian in large, bright classrooms with native, Italian-speaking teachers who love their work! In the student lounge you’ll find a small library and computers with free Internet access, as well as refreshments. It’s the perfect place to practice your Italian with other students! There are a variety of different tuition options available at our school – learn Italian the way you want to! Study in a group with other students on a Standard or Intensive Italian course in Genoa, or enjoy the personal attention of Private Lessons. On the Standard course, you’ll have 20 Italian lessons per week, whereas the Intensive course comprises 30 classes each week. Our school allows you to customise individual lessons according to your interests. Learn about subjects such as the history, art, literature, law, culture or cuisine of Italy, as you improve your Italian language skills! The course schedule for one-to-one lessons is also very flexible. Choose to have classes every weekday or for just three days each week, taking either two or four Italian lessons each day. Whichever course you choose, you’ll greatly improve your language skills and still have plenty of time to discover this unforgettable city! Combined Courses, including both group and Private Lessons, are also on offer at our school. These courses give you the chance to meet other students through your group lessons, and then benefit from specialised, one-to-one tuition as well. If you have a query about any of these courses, please contact us. The best way to fully experience the Italian culture is to live with Italian people! 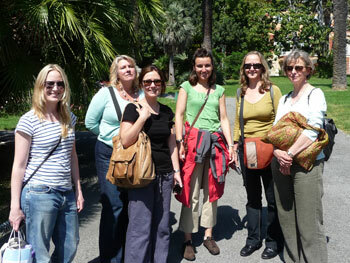 Our school organises accommodation with carefully selected Genovesi host families. Your Italian hosts will provide you with breakfast each morning, and a friendly, Italian-speaking environment, where your understanding of the language will improve day-by-day! 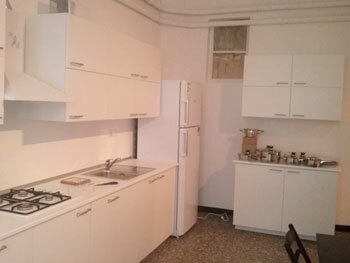 You’ll also be able to use your family’s kitchen during the evening. You might prefer the company of your fellow international students, in which case our school’s shared apartments are the answer. This option is great for socialising and meeting new people. 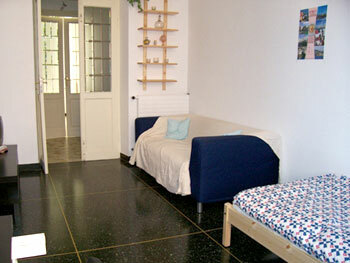 Or, if you’d like your own space whilst you learn Italian in Genoa, our school will gladly arrange a private apartment for your stay. 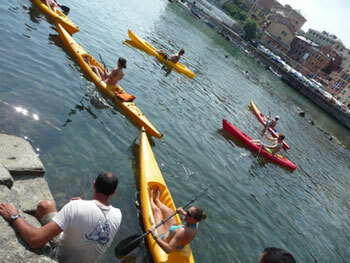 To run alongside your Italian course in Genoa, our school offers a range of extracurricular activities. 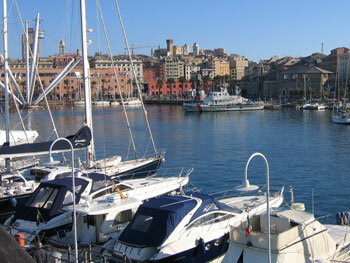 Firstly, there will usually be a city tour to familiarise you with Genoa’s ancient streets. Also, the school usually arrange a meal or typical aperitivo evening once a week, to help new arrivals meet their fellow students. Free seminars on a certain aspect of Italian culture are also occasionally offered. 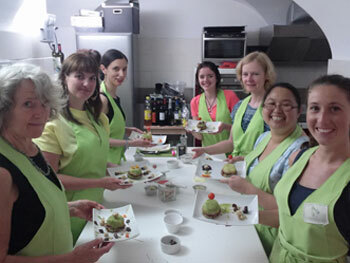 Other examples of typical activities arranged include Italian cookery lessons, wine tasting, nature hikes and meals out in local restaurants. 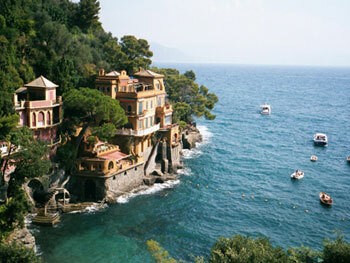 Or, explore some more of Italy on full-day excursions arranged by our school. Take a boat trip on the Italian Riviera, visit beautiful Portofino or witness the spectacular sight of some of the most beautiful villages in Italy, the acclaimed Cinque Terre! 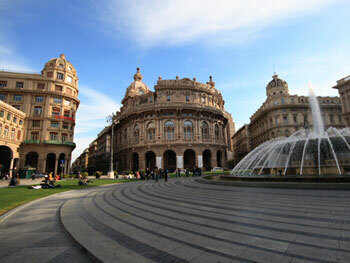 Upon your arrival in Genoa, our school will gladly collect you from either Genoa Airport or Genoa train station, although this service is not included in the price of the course. Average score for our school in Genoa based on 14 previous client reviews. It was excellent to do both grammar and have opportunity to do a lot of talking. The homestay accommodation was brilliant because the hostess was very friendly and was around to chat with in mornings and evenings. I just wanted to let you know that all the arrangements for my arrival, accommodation and attendance at the school were flawless - you run a very impressive operation! It was especially good to have such helpful and prompt responses from the other side of the world. The school itself was also superb - good facilities, great location and very friendly and skilled staff. My own teacher, Elena, was an absolute delight - very lively, funny and a great communicator. We all enjoyed her classes enormously and learnt a lot. What more could you ask for. 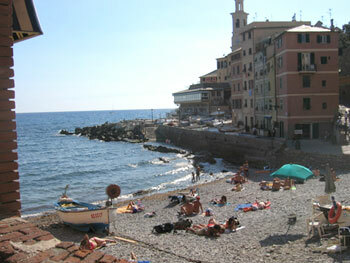 I hope I have the opportunity to return to Genoa in the future for a refresher (and Genoa is a great city, by the way). The class size was good - just 6 students The teacher was excellent - lively, interesting, patient, encouraging. The course material was a bit repetitive - lots of printed worksheets. I would have preferred more variety, involving more interaction, movement, different styles of teaching. I enjoyed most the conversational parts of the course, although the grammar was well presented and useful. My host was extremely friendly and welcoming. `She cooked excellent meals and I appreciated that she sat with me for an hour over the evening meal, speaking with me in Italian. The room was rather cold, although when I asked her my host turned the heating on. I just didn't like to ask too often. All classes were small -only 3 in mine, which was great with a pleasant, enthusiastic teacher. Lovely flat in the historic centre, easy walking distance from school and all city attractions. Delightful, friendly hostess. I was very impressed by the school which appeared well organised and with stimulating , engaging staff. I also felt that my level was exactly accommodated. I am an extremely satisfied customer and very happy with the tuition received. I would certainly be happy to attend another course at the school. The quality of teaching was excellent. There was the right amount of reading, writing and listening work. There were only 2 people in my class but that enabled more time for individual questions to be answered. The social activities they organised were good and were always very inclusive. Strolling around Genoa’s medieval alleys!